Prime Minister Roosevelt Skerrit by introducing thirteen new faces in the Dominica Labour Party (DLP) team to contest the next general election has acknowledged that there is the need for change at the level of government. That's what opposition leader Lennox Linton told a press conference, carried live by the State-owned DBS radio, but he added that that was not the change that Dominicans have been requesting for many years. "In December of 2018, the ruling Dominica Labour Party headlined the final year of its parliamentary term with parliamentary approval for a bill that effectively represents a vote of no confidence in its ability to manage the affairs of state," said Linton. "And so, quite fittingly, the campaign for the next general election began with a Dominica Labour Party endorsement of the vote of no confidence in its Cabinet of Ministers properly documented in the Climate Resilience Act 2018". Linton continued: "So Roosevelt Skerrit knows what time it is… it is time for change! 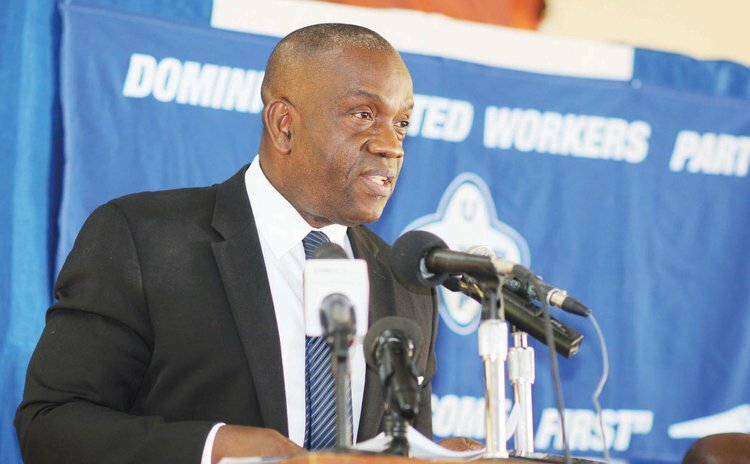 Leadership is everything… and when the leader has led the country into the misfortunes of leadership failures that justify the need for change, then the leader must change… In other words, as Dominicans have been insisting for the past two years: Skerrit must go! "But, of course, Skerrit does not want to go. He must go on. So, he discards 62% of the DLP candidates from the 2014 election and rejects 50% of his Cabinet as unsuitable to run for public office this time around. Skerrit's claim is that nothing is wrong with any of these rejected members of his leadership support team… all of them were performing marvelously well… the failed leader just needed to change some faces so that he can make a case for himself as the change the country needs from the results of his dismal performance as the head of government in the last 15 years." In his speech Linton contended that "real change" means freedom from "galloping unemployment", moving Dominica from "welfare to work" and developing the economy from "the smallest and weakest in the independent states of the English –speaking Caribbean". Referring to Anika Charles, the new DLP candidate for Marigot who withdrew a day after Skerrit named her, as "my family" Linton said: "We condemn the attacks on her which only surfaced because she answered the call to public service. We are very disappointed with the speed with which she was thrown under the bus by the Labour Party". In what sounded like an election manifesto, Linton said the "UWP stands ready" to amend the constitution to limit the number of five-year terms of a prime minister to two consecutive terms; to hold general elections at a fixed date and "grow the economy by 7% per year, create 12,000 new jobs by 2025, and increase the minimum wage and old age pensions by no less than 50%". One of the ways Linton hopes to ensure that extraordinary level of annual growth is to "enact legislation and regulations to legalize, grow, process and export Cannabis, and cannabis-based health and wellness products". He also promised that the UWP will "purchase at least two refrigerated vessels to transport Nature Island branded primary and processed agricultural products in the Caribbean."